There's lots of Tolkien web sites out there to browse around but start off at The Official JRR Tolikien WebPage and if you're not already a member of the Tolkien Society then now's the ideal opportunity to sign up! I'll not pontificate about the Society here but just display a few Tolkien related items I've been fortunate to have been able to pick up over the years that are either unique or not too far from it. This first item is not unique but there are only 10 copies in existence - as far as I'm aware. The Complete Ruins of Osgiliath was originally issued as 3 volumes of 100 numbered copies each. These were later reissued as a composite volume when only 12 copies were produced. Click on the page below to "read all about it". 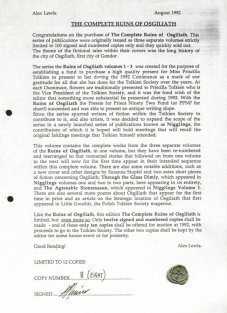 Alex Lewis is the creator and driving force behind The Ruins of Osgiliath; the seal on the opening page is his initial. Alex went on to create The Nigglings, an ongoing series of publications that he edits and which have the world of Tolkien as their backdrop. Often the stories that appear in Nigglings expand upon a theme that Tolkien mentioned in his Middle-earth sagas but went no further with. Sometimes the stories are merely influenced by Tolkien, although if you know Middle-earth you will know that the events could easily have happened in Far Harad or some other place that is little known. Alex has produced 21 volumes of Nigglings to date and 20 volumes of the Nigglings Special Issues, allowing writers more scope for longer stories. Each of the normal and special volumes run to around 60 pages or so. Contact Alex at Yew Tree House, Station Rd, Weston Rhyn, Oswestry, Shropshire. SY10 7RP for current subscription details, but be warned - Nigglings are addictive and don't cost very much. Don't say I didn't warn you! Now for something completely unique - at least I hope it is! When I lived in Portugal I was quite taken with the typical blue and white ceramic tile designs that are so ubiquitous in that country. 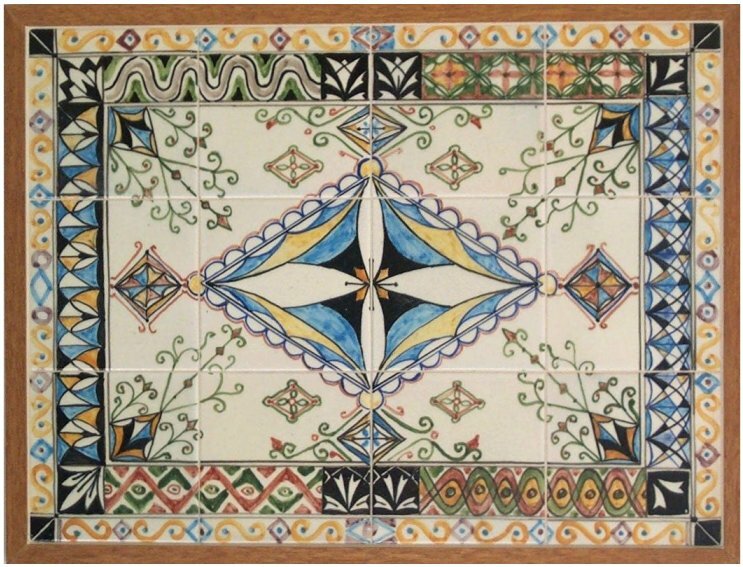 After buying a copy of Tolkien's 'Pictures' and seeing the textile and tile designs, I thought it might be possible to have one of them reproduced by a local Portuguese artist that lived nearby me. I actually liked one of Tolkien's textile designs over a tile design but didn't think it would make too much difference. 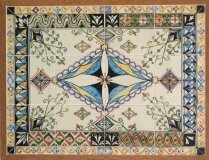 The design was transferred to the 12 15x15cm tiles and the faithful reproduction of the pattern is a credit to the artist whose name I unfortunately didn't record. I used normal tile adhesive and grouting to frame it in a simple frame of wooden battening. My final item is simply a copy of The Lord of the Rings - but a very special copy. I first read the Hobbit when I was 12, but it was another 7 years before I fell under the spell of Lord of the Rings. At that time I bought the one volume George Allen & Unwin 1972 paperback copy without the appendices or index for the princely sum of £2.10s. However, I remember seeing a copy of the hardback India paper edition in Smith's bookshop in Chichester for £12 and dearly wishing I had £12 to spare - not a chance, so it was the paperback for me (I still have it although it's a bit tatty now). Well times change and when Harper Collins published a new, limited edition of LotR on India paper in 1997 I couldn't resist it.